ATC fun & a mini technique tutorial! 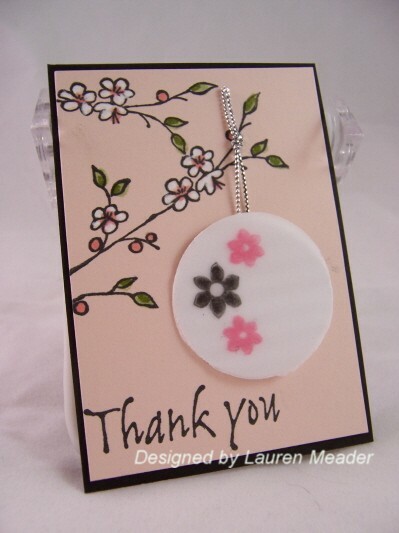 I am participating in a ATC swap. Those are so fun to do. You’d be amazed at the things people can do with a tiny canvas. There are some BIG TALENT in this swap (so intimidating) so I want mine to be up to snuff. I joined for 2 groups. I wanted to do something fun yet ORIGINAL! Not always easy. Since I am so in love with Chinese Paper Lanterns I figured a fun way to make my very own-stamp style of course! LOL! 1) I stamped my vellum cardstock with the flowers first. Let dry. 4) I layered the back with white cardstock (glue dots are on flower centers to adhere vellum without being able to see them). This allows you to make you “lantern” any color-pink, black whatever! I chose white so it would contrast with the bkgd. This also allows you to “hang” it without viewing the silver cord. Stamps set was by SU! Artfully Asian and Fancy Pants Pollen Dust. Colored with my white Singlo gel pen and markers by Prism. Well time was running out and sticking with original ideas, since I LOVE my Poppin Acetate technique and card figured I’d replicate that in smaller form! Hope they like it! Stamp and paper is listed in the tutorial. I would love to challenge you to make an ATC (card measuring 3/12 x 2 1/2) based on a larger card you or someone else may have done. Its a fun starting point. 16 Responses for "ATC fun & a mini technique tutorial!" Your ATC’s are so awesome, Lauren!! Wow!! These are so pretty, and frankly I’m jealous that yours are done already! LOL I haven’t even begun to THINK of my two groups! Love these! 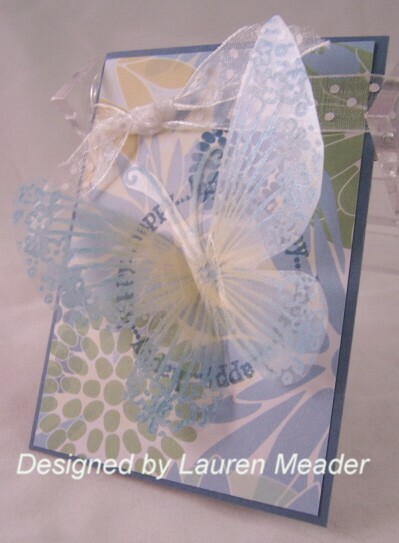 Wow, great ATC’s… Love the lantern idea, and that butterfly is gorgeous! I about fell over when these came in the mail today!! I LOVE the latern!! How creative you are! I really enjoyed these. Inspired again! I’m going to go dig into my vellum supply! I have been waiting for something special to use my vellum papers on. Thank you for sharing your art & talent to those of us who have the creative spirit too! Both are so gorgeous. But I LOVE that you came up with a way to make chinese paper lanterns for cards. oooo – the Asian lantern one is SOOOO cool – love it! Lauren – fantastic! Love the paper lanterns, and I bought a white stazon pad because of your tutorial…forever and day ago…(ask me if I’ve opened it 😉 ) great ATC’s – I bet the other participants will LOVE them! Those are beautiful! If you find anyone doesn’t like….tell them they can send it on to me! Beautiful job! Wow, Lauren. Those ATC’s are awesome; especially that butterfly; it is to die for. i love your blog,so cute and comfortable . ow, Lauren. Those ATC’s are awesome; especially that butterfly; it is to die for. ow, Lauren. black pearls Those ATC’s are black pearl earrings awesome; especially that butterfly; it is to die for.